Gotta get those Eiches on the road again! It’s one of those things that my dad when I was young, and I feel it’s my responsibility as a father myself to continue it. Namine is not old enough yet to think that all my jokes are dumb, and she loves this little road trip ritual. 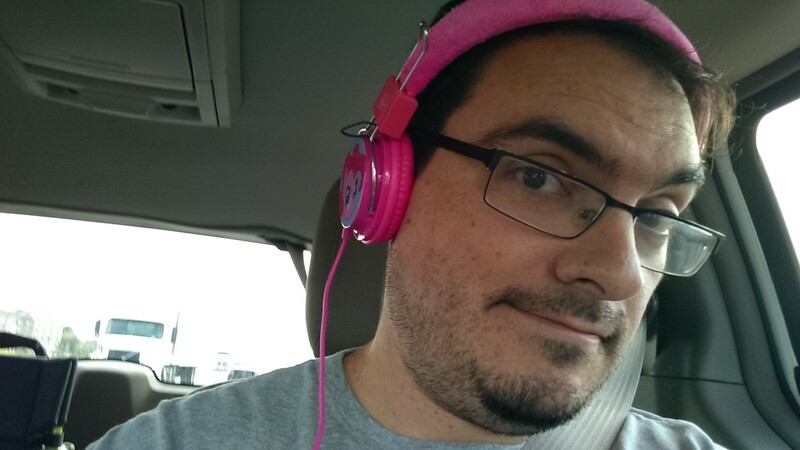 She even let me borrow her My Little Pony headphones. We decided earlier in the week that since we had no desire to put Namine through the misery of airsickness again, we’d better drive home. Our checkout from Give Kids The World was Friday morning anyway, and none of us need to be back home until Monday — I and my aunt have work; Jessica and Namine have therapy and school — thus, we had enough time for the drive without disrupting anyone else’s schedule. The real trick was getting Make A Wish on board, since the car rental in Florida was through them. It took some back and forth phone calls to straighten everything out, especially since the round-trip plane tickets were bought in advance. As it turns out (and as no real surprise to anyone), Make A Wish has dealt with situations like this before: having to arrange for a child to drive home instead of flying home. We even got to keep the rental we’ve been using (which, since it was large enough to accommodate Namine’s wheelchair and an adult-sized electric scooter, is also large enough to accommodate all our luggage). Long road trips are hard on anybody, especially children who are normally all go go go. Namine has done really well today, though, and has been content with playing her math game on my phone and reading. The book Namine has been really into lately is A Girl Named Helen Keller. 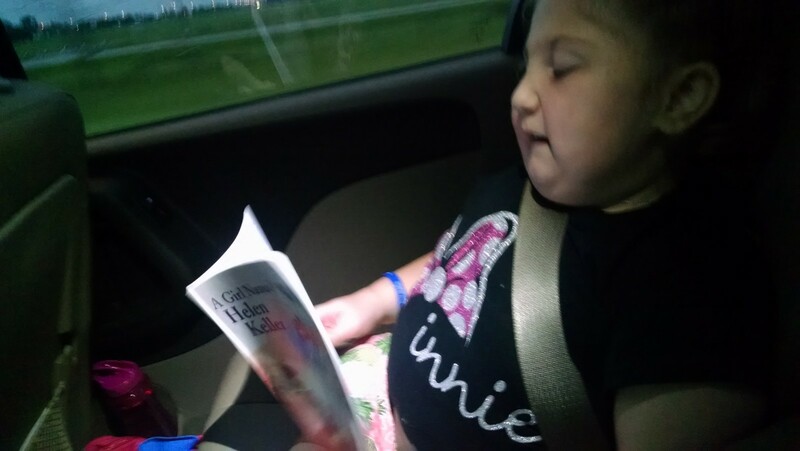 She cannot get enough of this book, which is about Helen Keller’s life as a child, and how she was able to get to the point of communicating with others through sign language.